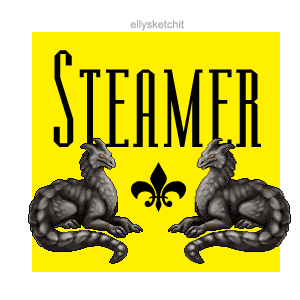 As their name implies, these coal wyrms produce varying jets of steam instead of fire like most people expect dragons to utilize. The water can be just as hot, however, and their power is not to be taken lightly. Stanley presides over an area of the Callisto Islands that has an interesting history. No one knows exactly how it got to be there, but on the far side of the island there is a large, gaping maw leading down so far no one can see the bottom. What was terra firma had somehow become a giant crevasse, disturbingly dragon-sized. Wyrm and dragon kind are sometimes said to be seen flying and crawling out of the depths which makes it a very treacherous place for humans. Stanley guards this area - known simply as "the gap" by island residents. Please breed as much as possible, especially because the crash glitched them and we lost a firstborn.